Comments: I loved this book! This was fantastic because I had this habit of accumulating lots of clutter purely because I used to never throw away stuff all that easily. 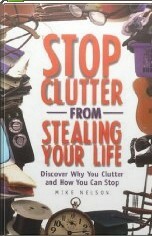 As I was listening to this book, I remember I went on this de-cluttering exercise where I threw away half of my existing ‘stuff’. And since then, I have been regular at decluttering and keeping just the essentials! Add on Mar 16, 2016: A full 8 years or so after reading this book, it continues to inspire a relatively minimalist way of live.